On this page you will find a collection of data related to Amtrak’s Vermonter service. The chart above shows that the departure delays associated with Amtrak’s southbound Vermonter service (Trains 55 and 57) through the Pioneer Valley. Commentary | Significant focus has been applied by New England Central Railroad in Vermont over the past months to clear long-term slow orders on their main line. With this work substantially complete the southbound Vermonter has been operating on our close to schedule in recent weeks. For the month of January 2019 the Vermonter was effected by delayed caused by winter weather. The chart above shows that the departure delays associated with Amtrak’s northbound (Trains 54 and 56) Vermonter service through the Pioneer Valley. Commentary | The on-time performance of the northbound Vermonter has significantly improved in the past few weeks. This is due to the completion of major track work on Amtrak’s Springfield – New Haven rail corridor and Metro-North’s New Haven Line. The table below shows the average daily delay for Amtrak’s Vermonter service between Springfield and East Northfield, Ma. (the VT-MA state line) during the period that the train is traveling on the MassDOT-owned Connecticut River Line. Note that this is the combined daily delay for both the southbound and northbound trains. 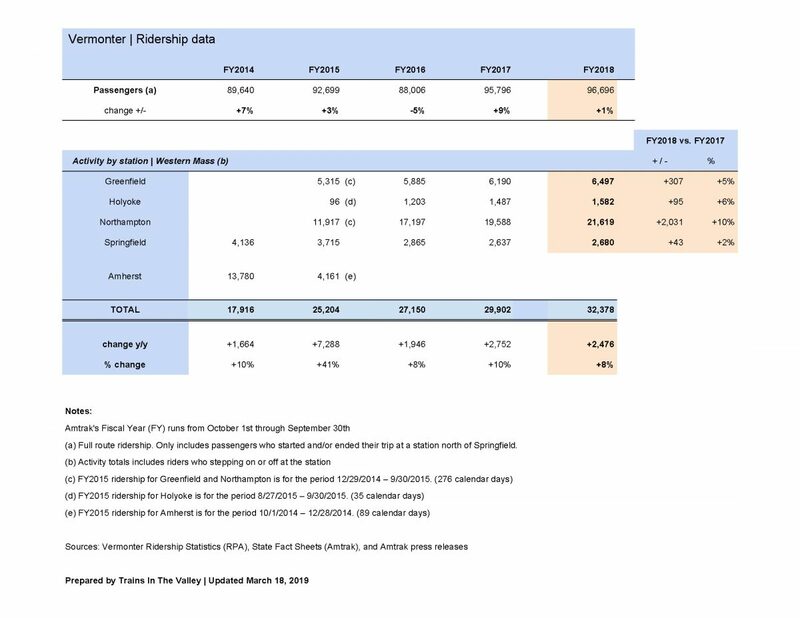 Ridership totals include passengers who started and/or ended their trip at a station north of Springfield.